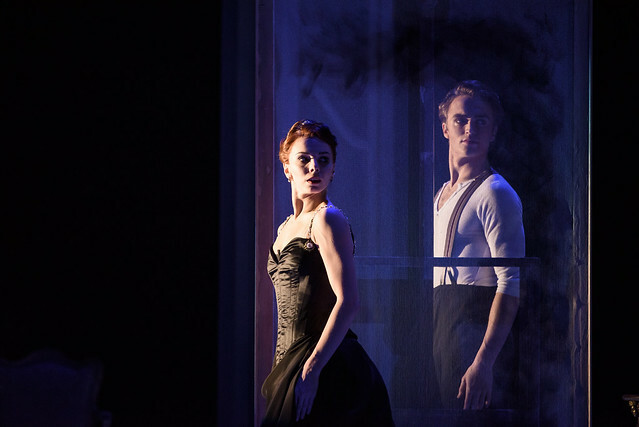 Christopher Wheeldon, Artistic Associate of The Royal Ballet, is a familiar figure to Covent Garden audiences – but this is the first time the Company has presented an all-Wheeldon mixed programme. It offers an opportunity to see just how widely his choreographic talent ranges. Two acclaimed abstract ballets, created for American companies, bookend a new narrative commission from The Royal Ballet, bringing together different sides of Wheeldon’s career. For the three ballets in this programme Wheeldon has used the music of three very different contemporary composers. The beautiful simplicity of Arvo Pärt comes first, a haunting setting for Wheeldon’s After the Rain. Italian minimalist composer Ezio Bosso provides the score for Within the Golden Hour, incorporating music by Vivaldi. And in-between comes a dynamic new score from Mark-Anthony Turnage, specially written for Strapless. Turnage has previously collaborated with Wheeldon on ‘Trespass’ (Metamorphosis: Titian 2012), co-choreographed with Alastair Marriott. Wheeldon created After the Rain in 2005 for New York City Ballet. This abstract ballet for three couples has become most widely known for its deeply affecting pas de deux, set to Pärt’s profoundly moving Spiegel im Spiegel. The pas de deux has often been performed on its own, including by The Royal Ballet in a 2012 gala performance, and was famously captured on film with NYCB principals Maria Kowroski and Ask la Cour dancing at dawn on the roof of a skyscraper on the World Trade Center site. This is the first time the work has come to the Royal Opera House in its entirety. For this new narrative ballet Wheeldon has drawn inspiration from an arresting portrait by John Singer Sargent – one that, in its time, was the source of much controversy. Sargent’s 1884 portrait of Amélie Gautreau – titled Madame X – was intended to strengthen her position as one of Paris’s most celebrated society beauties. But, thanks in large part to the painted detail of a strap slipping scandalously from her shoulder, the work tarnished Amélie’s reputation forever. Inspired by Deborah Davis’s book Strapless, Wheeldon takes us inside the glamorous beau monde of Amélie and Sargent, and explores the ever fickle nature of celebrity. Within the Golden Hour was created in 2008 for San Francisco Ballet, to mark the company’s 75th anniversary. Wheeldon choreographed the work for 14 dancers, and includes much of his characteristically inventive handling of ensembles. Three central pas de deux lead to a finale in which the whole cast comes together in a single, shimmering formation. Strapless runs from 18–31 May 2017. Tickets are still available.